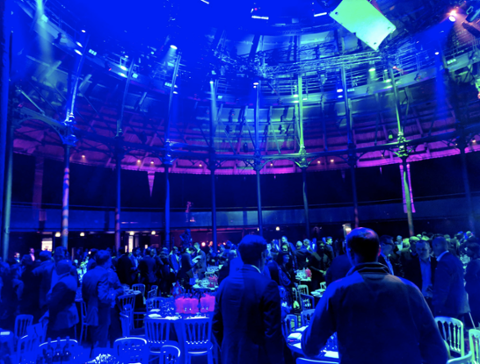 On May 3, Samford University’s Center for Sports Analytics played an important role at the 2018 Yahoo Sports Technology Awards, a major international sports awards gala in London, England. The program attracts entries from more than 30 countries and five continents, representing more than 50 sports. Awards' categories reflect visionary work throughout sports in front of an audience of senior industry figures, influencers and athletes. The Center for Sports Analytics served on the panel of judges for the 2018 edition of the event, also known world-wide as the “Oscars of Sports Technology.” The panel, comprised of international figures from sports and technology, collectively represents every facet of the sports technology industry. Samford was one of only two United States universities represented on the panel. The other was Babson College’s Blank Center for Entrepreneurship. Judging is completed online, independently of and without reference to any other scorer. Consisting of 32 experts from across the globe, the judges’ panel included individuals such as Brett Kirby, lead physiologist for Nike Next Generation Research; Daniel Marion, chief of information and communication technology at the Union of European Football Associations (UEFA) based in Lausanne, Switzerland; Pete Samara, director of innovation and technology at Formula1; Paul Francis, head of sport science at Adidas; Mike Ruddell, innovation manager at Sky Sports Innovation; Justin Bergh, general manager for the CrossFit Games; Ben Martin, head of sport for Amazon Tickets; and Mike Scarano, head of global digital connectivity and innovation at Puma. Some of the worldwide organizations that received awards at the 2018 event include Wimbledon, FitBit and Catapult Sports. Winners from previous years have included Garmin, Barclays, Draft Kings, TopGolf, Bleacher Report, Ticketmaster, PGA Tour, Sacramento Kings, Tour de France, the NBA and UEFA Champions League, among many others. To learn more about the 2018 Yahoo Sports Technology Awards and how Samford’s Center for Sports Analytics was represented, see here.